The SBMiners team recently won the MITRE Corporation’s 2018 Healthcare Anti-Fraud Academic Competition. The team includes Ph.D. student Kang Lin Hsieh and M.S. students Adeola Akinfaderin, Avi Raju, who served as team lead, and Bin Yao. Associate Dean for Academic Affairs and Associate Professor Susan Fenton, Ph.D. is the team’s academic advisor. During the competition, students from U.S.-based colleges and universities worked collaboratively to create innovative approaches for finding fraud while using a dataset and tools provided by MITRE. The competition encouraged teams to develop innovative solutions that could help government and private healthcare payers reduce dollars lost due to healthcare fraud. SBMI would like to congratulate all summer 2018 scholarship recipients and thank all students who took the time to apply. Retired SBMI Associate Professor, James “Jim” Turley, PhD recently donated $100,000 to fund the James Turley Endowed Scholarship for Global Health. The scholarship will go to SBMI students in good academic standing and preference shall be given to international students who intend to practice in their home country and US Citizens and permanent residents who intend to practice outside of the United States. “It is important for students to take the skills and education gained here at SBMI and apply it in other countries.” Turley continued, “I hope students will foster feelings of pride as they become informatics leaders in their own nations or take their informatics practices to foreign places. Having the informatics knowledge is not enough; they should desire to serve those who need the resources most." Click here to view the complete news story. M.S. 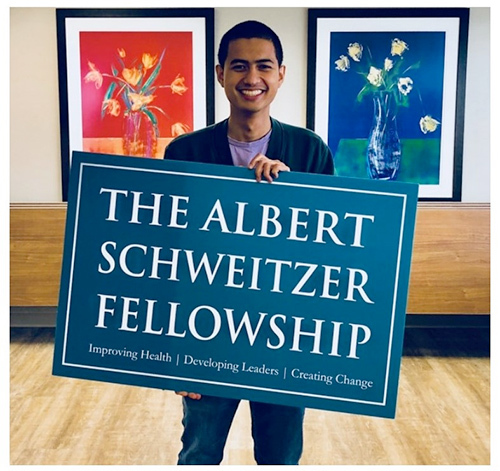 Student Danilo Peña has been named a participant in the Albert Schweitzer Fellowship – Houston Galveston program. Professor Jim Langabeer’s, PhD, MBA new multi-institution pilot study was featured in an UTHealth news story. The study, called Houston Emergency Opioid Engagement System, or HEROES, uses a three-pronged approach. The program includes the administration of medication to treat opioid dependence in the emergency department, a follow-up visit to the patient’s home by a paramedic, and peer support and counseling from a recovery coach. The National Human Genome Research Institute (NHGRI) awarded Degui Zhi, PhD, associate professor, a grant worth more than $2.3 million. Zhi and his co-principal investigator will build “algorithms to identify shared DNA segments within large cohorts,” Zhi stated. “We aim to advance genetic research by building new informatics tools that reveal detailed genetic relationships between humans.” Click here for more information on the award. Professor Dean Sittig, PhD has a new co-authored research article that was published. FOX 26 News recently interviewed James Langabeer, PhD, MBA. He discussed the new home-visit program to help people who have overdosed from opioids. Langabeer also discussed the intervention with WOAI Radio in San Antonio.